Caroline is the perfect value-driven barge for “foodies” who wish to travel on a budget while enjoying a warm and personalized cruise. 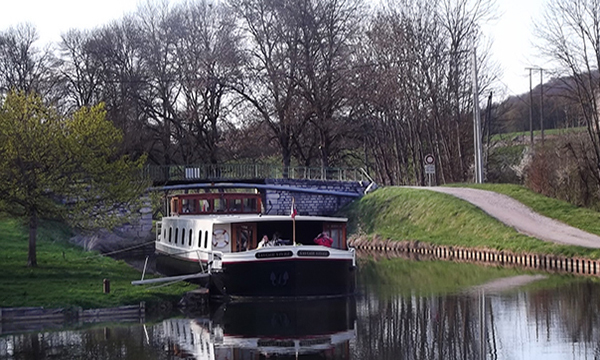 The Caroline is owned and operated by Ute and Uli Weber, who originally hail from Germany, but have been residents on the Canal du Midi for 30 years. In another life, Chef Ute was a pediatric nurse, and still has a soothing character to her, while Captain/Tour Guide Uli is the spunkier one. Together they have created a delightful barging experience, paired with exciting culinary explorations and lots of local flair. 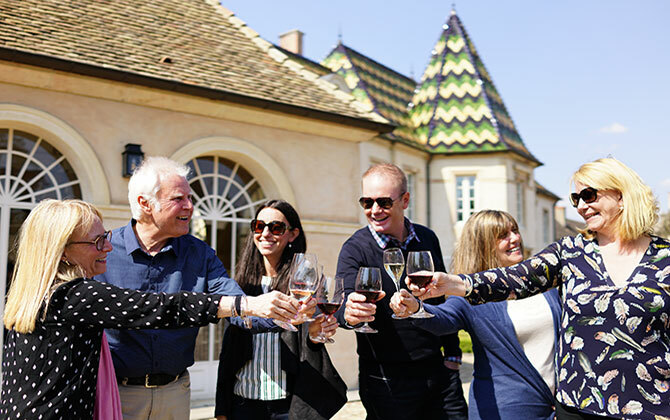 The Canal du Midi’s lively cuisine culture is at the forefront of the Caroline’s program, as guests enjoy, at their own expense, two lunches and one dinner ashore at local bistros; an additional luncheon ashore is included in the cruise price. For the meals ashore, Captain Uli handles the reservations and transfers for guests; uniquely, a handful of the dining venues are located in charming villages within walking distance to and from the Caroline’s moorings! 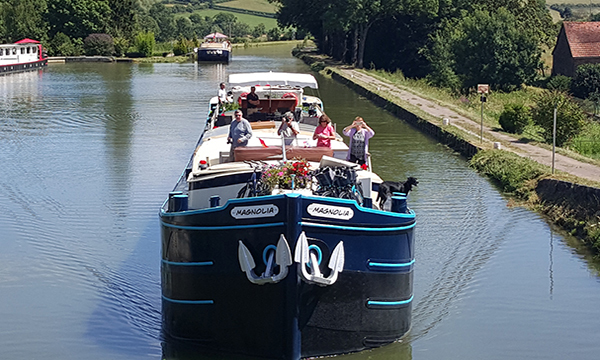 Back on the barge, the ambiance is relaxed and casual, encouraging guests to lounge and linger as the boat gently plies the Canal du Midi. Chef Ute spends her time in the galley preparing her seasonally inspired menus, and regularly invites guests into the kitchen for informal cooking demonstrations. In the salon, the seating around the wood burning stove is the perfect spot to curl up with a glass of wine or cup of tea, socializing with your barging companions. Splashes of color and comfy bedding abound in the cozy cabins, while the ample seating on the Caroline’s flower-festooned deck adds further to festive ambiance. Note the two twin bedded cabins have bathrooms across the hall as opposed to en suite. Gentle strolls and leisurely bicycle rides further the Caroline’s informal fun. Daily excursions are led by Captain Uli, ensuring guests receive a personalized introduction to the region’s many historical attractions, Roman ruins, and preserved antiquities. In the afternoon, you will be met by a crew member of the Caroline at the designated meeting point. From here, relax as you are chauffeured to the barge, moored nearby. A traditional champagne welcome awaits you, before a short cocktail cruise and your first gourmet dinner onboard. The day begins with a visit to Oppidum d'Enserune, a pre-Roman hilltop settlement and one of the most important archaeological sites in the region. Enjoy lunch ashore at your own expense, after which your Tour Guide returns to the barge for an afternoon cruise. Relax on deck and admire the passing scenery, or explore the towpath with a gentle pedal or leisurely stroll. The gastronomic journey is furthered this evening as Chef Ute presents dinner onboard. This morning your Tour Guide takes you to visit to a lively local market in Olonzac. Shop right alongside the locals for seasonal fruits, colorful vegetables, artisan breads, and spice blends. Enjoy a coffee in one of the cafes, or browse the pedestrian area. After exploring the village, your Tour Guide returns you to the Caroline for an unhurried afternoon cruise. Laze on deck with a glass of wine, or explore the towpath’s flora and fauna by bicycle on foot. Tonight's dinner is at your own expense, enjoyed ashore at a charming bistro. The morning begins with a visit to Narbonne, a regional capital established in 118 B.C.E. as a Roman colony. After Captain Uli treats you to lunch ashore, return to the barge for a leisurely afternoon cruise. The Caroline docks right next to the esteemed Chateau Ventenac for a winetasting of their famous AOC Minervois, made from grapes first introduced to France by the Romans. Upon reaching tonight's final mooring, visit Chef Ute in the galley for an informal cooking demonstration before drinks and dinner are served onboard. Your Tour Guide escorts you to this morning to Minerve, a preserved Medieval city with fascinating social, historical, and military import. Explore the evocative remnants of what was once a Cathar stronghold. After a lunch ashore at your own expense, return to the Caroline for a lazy afternoon cruise. Now is the perfect opportunity to lounge on deck and admire the countryside, or explore the towpath with a gentle pedal or leisurely stroll. Relax over cocktails and canapes before another gourmet dinner is served onboard. A morning cruise presents the perfect opportunity to relax on deck with a cup of coffee or tea. This afternoon, your Tour Guide chauffeurs you to Carcassonne, a fortified Medieval fortress with a walled city. Explore the ancient castle and preserved ramparts to admire the mighty 53 Roman towers. Stroll the cobblestone boulevards into local cafes and specialty boutiques. Return to the Caroline and feel free to join Chef Ute in the galley while she finishes preparing the Farewell Feast onboard. all meals from dinner the first night to breakfast the last morning, except three meals ashore (a combination of lunch and dinner).